It's not just cats and dogs who need to be adopted. All across the country, it's raining cats and dogs and… lizards? While the vast majority of the adoptees during the Clear the Shelters pet adoption drive were cats and dogs, there was plenty of variety in the species available to potential owners at shelters across the country. At the Humane Society of Calvert County in Maryland, a pot-bellied pig named Channing Tatum was headed for a new home. He also likes other animals, but not other pigs, she said. According to Samler, the Humane Society rescued him from another shelter. 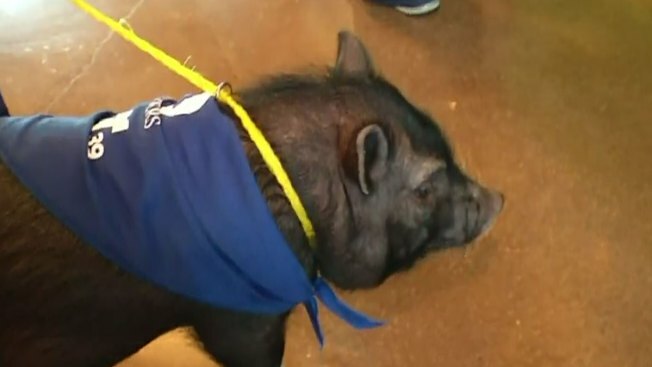 In Irving, Texas, another pot-bellied pig, George, was adopted from Irving Animal Services. He will spend the rest of his days on his owners' goat farm. MSPCA-Angell, in Massachusetts, also had guinea pigs, a domestic rat, a grey macaw and a chinchilla ready for new homes Saturday. In Los Angeles, the West LA Animal Care Center had already given three rabbits homes shortly after opening its doors. Bunnies were available for adoption in Texas, as well as in the San Francisco Bay area and Voorhees, New Jersey. Texans heading to a shelter in search of a new pet Saturday could also find at least one hamster and a hedgehog. Shelters in the D.C. area, meanwhile, reported giving forever homes to another hamster, as well as two turtles and a ferret. And yes, in New York, there were even lizards in need of loving owners. All creatures, great and small, were up for adoption on Saturday. More than 17,000 animals were placed in adoptive homes as part of the drive, which was sponsored by NBC Owned Television Stations and Telemundo Station Group. NBC Owned Television Stations' Cynthia Andrews and Noreen O'Donnell contributed to this report.